DO NOT handle Red Copper inside the oven without using oven mitts because the pan and handles will be very hot. DO NOT directly expose the glass to a burner or other source of heat, do not use lid in oven. DO NOT put lid under faucet or in wet sink when it is hot. DO NOT allow damp fabric to contact the lid when the lid is hot. DO NOT apply sudden force to the glass lid, as it may shatter. DO NOT remove dried food from the lid with sharp or metal utensils as the lid may be damaged. DO NOT attempt to repair lid if it is chipped or cracked. DO NOT use your cookware in the microwave or toaster oven as this might cause electric sparks or fire, or damage the microwave and your cookware. DO NOT use aerosol cooking sprays. These sprays will build up on cookware and become difficult to remove while reducing the nonstick coating. Use care when using the glass lid. 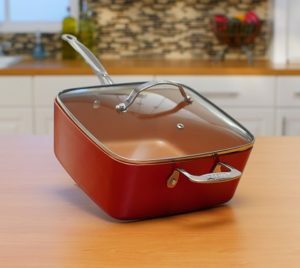 As with any glassware for cooking, the lid could break due to sudden temperature changes or impact if it is dropped or knocked against a hard object. Monitor cookware during use to avoid potential injury to children or the risk of fire. Always carefully oversee children who are near cookware that is in use, or injury may result. Allow lid to cool before washing. Avoid sudden temperature changes to lid. Preheat oven before placing cookware inside the oven. Immediately stop using the lid if the lid cracks, chips, or becomes badly scratched. Be careful when handling broken glass because the pieces may be extremely small. Always use care when handling hot cookware to avoid potential injury. Lid and handles might become hot during prolonged cooking. 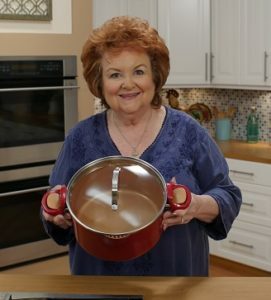 Use oven mitts or pot holders with lifting the lid or the cookware. Never leave an empty Red Copper pan over a burner that is hot or turned on. This may damage your cookware or the stove. This product is for home use only. It is not intended for camping or commercial use.